(Nanowerk News) GE announced eight winners of its 3D Printing Design Quest, which challenged innovators to redesign loading brackets found on jet engines using 3D printing. The redesigned brackets reduce engine weight and fuel consumption. M Arie Kurniawan, based in Salatiga, Indonesia, won the first place prize of $7,000. The balance of the $20,000 prize pool will be awarded to the finalists capturing second through eighth place. 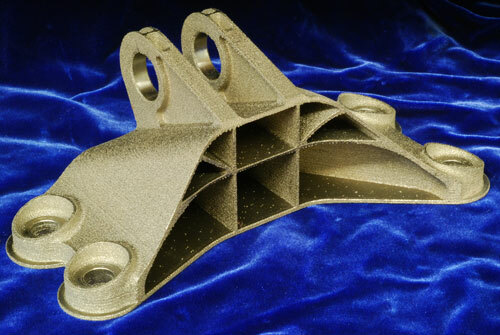 The top ten bracket designs were additively manufactured at GE Aviation’s additive manufacturing facility in Cincinnati and subjected to rigorous load testing, at GE’s Global Research Center in Niskayuna. Testing parts to failure was performed to ensure the winning designs meet the highest quality and performance criteria. Loading brackets on jet engines play a critical role: they must support the weight of the engine during handling without breaking or warping. The first place prize-winning bracket in GE’s 3D Printing Design Quest designed by M Arie Kurniawan from Salatiga, Indonesia. GE and GrabCAD, working closely with digital strategy firm Undercurrent launched the Design Quest in June 2013, drawing a record number of entries via GrabCAD’s community of engineers and designers, with nearly 700 entries from 56 countries. Hardi Meybaum, CEO of GrabCAD said, “Our Community really responded to this real-world engineering challenge from GE. There were an extraordinary number of submissions, from around the world, because engineers want the chance to design something that may make it into production and solve a real problem. GE's Jet Engine Bracket Design Challenge exceeded expectations and shows its commitment to seeking innovation through open engineering and collaboration. It's the way of the future, and we love that it's happening on our platform." 1. M Arie Kurniawan, based in Indonesia. 2. Thomas Johansson, Ph.D, based in Sweden. 3. Sebastien Vavassori, based in the United Kingdom. 4. Nic Adams, based in Australia. 5. Fidel Chirtes, based in Romania. 6. Mandli Peter, based in Hungary. 7. Andreas Anedda, based in Italy. 8. Piotr Mikulski, based in Poland. To view the additively manufactured brackets click here. For more information about GE Open Innovation visit http://www.ge.com/about-us/openinnovation and join our Google+ Hangout: Open Innovation and the Maker Community on Friday, December 13th at 11:30 AM EST.